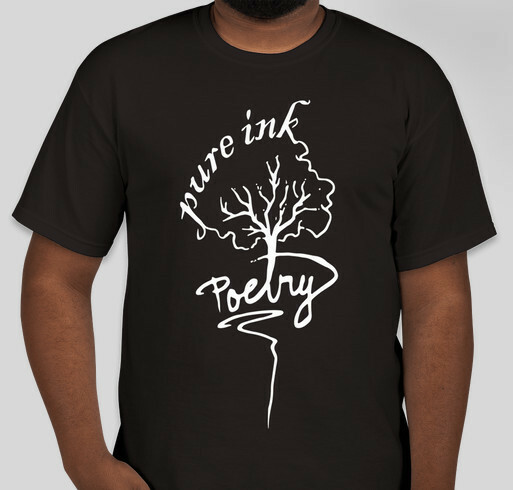 Buy a shirt to help us raise travel funds for our National Poetry Slam Team. All funds raised will be paid directly to Pure Ink Poetry for Pure Ink Poetry National Slam Team. Pure Ink Poetry is Buffalo’s only monthly poetry slam and is nationally certified by Poetry Slam Incorporated (www.poetryslam.com). Recently, Pure Ink Poetry’s Slam Team qualified to represent Buffalo, New York in the 2017 National Poetry Slam (NPS) Competition. NPS is the largest team performance poetry event in the world. Teams from all over and beyond North America will converge in Denver, CO August 7-12, 2017. Pure Ink Poetry is reaching out to the community for support to help the team travel to Denver, CO. Pure Ink Poetry has existed since January 2012 but the team that bears its name began to make their mark in the fall of 2013. The Pure Ink Poetry Slam Team bested several other teams from around the state and won the 2014 Empire State Poetry Slam. They carried that momentum into 2014 and 2015 by winning the Wordfest Team Poetry Slam in Albany, NY. They continued their winning streak by winning the prestigious regional QEW Poetry Slam in 2014 and 2016 by besting teams from both New York state and Southern Ontario, Canada. The Pure Ink Poetry Slam Team qualified for Nationals through regional victories and a qualifier in February 2017 where they were victorious over teams from Pittsburgh, PA, Cleveland and Columbus, OH. During the past 5 years, the Pure Ink Poetry Slam Team has performed at every major festival and event in the Buffalo area and has worked with and done shows for numerous cities, communities, universities and non-profit organizations. I am donating and purchasing in honor of Skyler Jaye. A wonderful young woman that I am honored to know...and to support all of you that love your craft and make the world a better place because you share with the rest of us <3 Go Team!!! Supporting Skyler Jaye and Megan Kempel! Share Why You Support "Pure Ink Poetry"